Startup odds are tipped against you. You can beat them. Most startups fail, but yours doesn’t have to. Here’s how to beat the odds. Startup odds are tipped against you. Here is some advice for beating them. In this era of startups, a good idea is a good start, but it’s just the beginning. You still need to raise money, market your product or business, and attract customers. It’s a lot of work and requires a lot of strategic planning, which is most likely why 75 percent of venture-backed companies fail. Take advantage of the knowledge of others who’ve been down this road—they can offer a wealth of knowledge and experience that can help you immeasurably. Companies like IdeaGist.com, the world’s largest virtual startup incubator that utilizes a collaboration platform that helps people with ideas work with other entrepreneurs, mentors, and companies to develop their ideas, receive advice on dealing with challenges, and guidance moving an idea from initial concept to launch. IdeaGist.com has a defined process and timelines for entrepreneurs that provide clarity in expectations. Unlike other startup incubators, IdeaGist does not take ownership of the ventures it incubates. 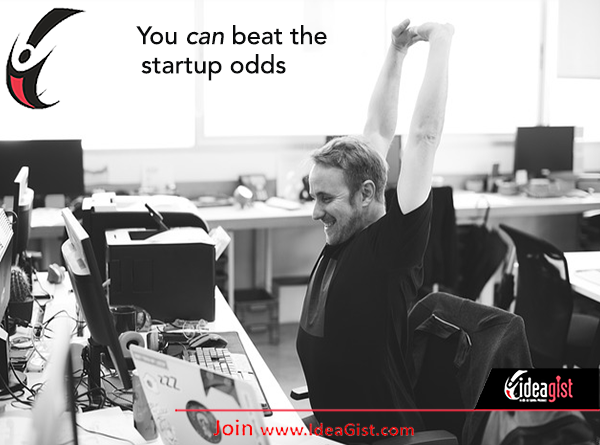 IdeaGist offers a host of features that guide startup founders in more than 300 countries through the development process. And since it’s online, it’s as convenient as it gets. Another reason so many startups fail is a sole founder tries to do it all alone. Successful startups need a team of smart, motivated individuals who possess the skills that you lack. A strong team allows you to delegate wisely and get things accomplished. Build a team with people who are as passionate as you—launching a startup demands long hours at the office. It’s not a 9-5 schedule. The right staff will be as committed to the grueling pace as you are, and the camaraderie has a positive impact on whether or not your startup succeeds. A great team is in it to win it—they will be your first brand ambassadors. Your team is your most important investment. The key to developing a successful startup can be summed up in one word: pivot. Building a new business requires a lot of testing what works, taking calculated risks, and learning from failures rather than throwing in the towel. The very nature of building a startup requires a commitment to staying flexible and learning how to adjust when things don’t work out the way you expected. Consider failures as learning opportunities; step back and apply those learning opportunities as many times as you need to. Rome wasn’t built in a day either.